Boasting a trove of never-before-seen archival footage, American Masters: Richard Linklater – dream is destiny provides an unconventional look at the fiercely independent style of filmmaking that emerged out of Austin, Texas in the late 1980s and 1990s, with Linklater – writer, director, producer, actor, and Oscar nominee – as its poster boy. 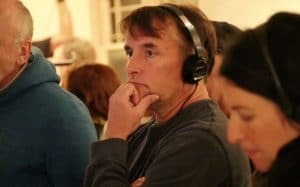 Linklater is known for such films as Boyhood, Dazed & Confused, Slacker, and the Before trilogy. Through early writings from his journals, telling interviews shot at his home, and more, explore his fearless approach and the extent to which his filmmaking existed, and continues to exist, decidedly outside of the production power bases of Hollywood and New York. Clips from his most beloved films and new interviews with actors and collaborators Matthew McConaughey, Patricia Arquette, Ethan Hawke, Jack Black, Julie Delpy, and Kevin Smith, as well as colleagues and friends like Kent Jones, John Pierson, and the late Jonathan Demme demonstrate his collaborative spirit and process. On CPTV: Friday, September 1 at 10 p.m.